Allow us to introduce one of the longest-lasting gaming laptops we’ve tested to date – and one that still brings the muscle when it’s time to game or work: the Gigabyte Aero 15X. Just watch out for a few cut corners in the name of value. This is a review of the 2017 version of this laptop. Click the following link to see our review of the 2018 Gigabyte Aero 15X. With its first gaming laptop employing the Nvidia GTX 1070 in its new Max-Q chip design, Gigabyte brings its value-focused approach to the popular new device format. Allow us to introduce you to one of the longest-lasting gaming laptops we’ve tested to date – and one that still brings the muscle when it’s time to game or work: the Gigabyte Aero 15X. This is one of the most competent gaming laptops we’ve used with one of the best keyboards we’ve typed on and an extremely color accurate display. Sure, you’ll find that this laptop cuts a few corners to offer a comparable Max-Q experience to its pricier rivals. But, it’s easy to overlook those pockmarks in the name of value and versatility. Gigabyte has priced its Aero 15X laptop similar to competing Max-Q gaming laptops at $2,199 (£1,999, AU$3,199) to start. That price gets you all of the goodies you see in the spec sheet to the right, but can support up to 32GB of RAM and basically as much storage as you can fit inside its M.2 NVMe slots. The comparable MSI GS63VR 7RG Stealth Pro asks for $2,399 (£2,199, AU$3,199) to start, but one-ups the Gigabyte model in several key areas. With double the memory and 2.5 times the storage with a 512GB solid-state drive (SSD) and 1TB hard drive, it’s better equipped than the Aero 15X. Furthermore, this laptop has a faster, 120Hz FHD display to boot. Meanwhile, the gold standard of Nvidia Max-Q gaming laptops, the Asus ROG Zephyrus GX501, calls for $2,299 (£2,698, AU$3,699) to start for similar – if less overall – hardware inside, like 16GB of RAM and a 256GB SSD, but with the 120Hz display. 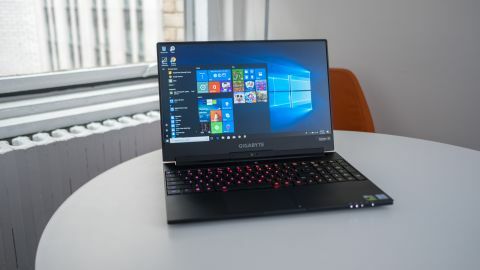 However, you can trick this laptop out with a GTX 1080 Max-Q graphics chip and double the storage for a cool $2,579 (£2,660, AU$4,999) – not bad for a huge upgrade. The Gigabyte Aero 15X is available now in the US through NewEgg and Amazon, in the UK through Scan and other retailers and in Australia through Affordable Laptops and more. Like most machines from Gigabyte, the Aero 15X puts forth an awfully simple design, which in this case is a good thing considering it lacks the ostentatious nature of most gaming laptops. The only identifying element to its all-black, brushed aluminum lid and base is a stylized triangle of black woven plastic just above the hinge that’s made to look like carbon fiber. Opening the laptop reveals a nearly bezel-free display – so much so that Gigabyte moved the webcam in the hinge of the screen. While we don’t see many people using this laptop for video chats but rather gaming, it’s still not ideal. Imagine trying to livestream from this laptop to Twitch or Mixer: you’d be showing the world your nostrils in 720p. Being an Nvidia Max-Q laptop, the Aero 15X lives up to its name in being incredibly thin and light as far as gaming laptops are concerned. It’s not thinner than either the Asus or the MSI laptops listed above, but it is at least lighter than the Asus. The MSI takes the cake here at less than 4.2 pounds heavy. Yes, you’ll definitely notice the Aero 15X in your bag, but it’s nothing much heftier than a 15-inch MacBook Pro weighing you down. Despite its thinness, Gigabyte managed to cram an absolutely wide array of hardwired connections within the base, including not only Thunderbolt 3 but dedicated mini DisplayPort and HDMI-out connectors. Also in spite of the minimal Z-height is a wonderfully deep and forceful, RGB-backlit keyboard complete with numpad. The keyboard is a delight to type on with slightly concave keys that bounce back forcefully from underneath your fingers. Gigabyte’s Fusion software makes the keyboard even sweeter with deep backlighting controls and profile management. All of the keys are evenly lit and make for an attractive device. The touchpad, however, is frankly a mess. Using Elantech sensors, there are literal dead zones of touch response towards the left side of the pointing device. Plus, palm rejection isn’t very helpful; the cursor moves constantly in accordance with the base of our thumbs as we type. At the very least, most gamers or even media pros would likely bring along a mouse to use this laptop. Speaking of media pros, Gigabyte is targeting both that crowd and the gamers with its 15.6-inch, 1080p Pantone certified display. With wide viewing angles, anti-reflective matte coating and nigh-impeccable color reproduction, this screen will sing whether you’re working with photos and video or working through that next dungeon. That said, the display – while calibrated with X-Rite Pantone hardware – only refreshes at 60Hz. That’s half the speed of the displays offered by its Max-Q competitors, which is a bummer considering the device’s price and that it’s targeted toward gamers as much as it is media creators. At any rate, you’re looking at a display that will treat both your games and your precious media files with the utmost color accuracy.